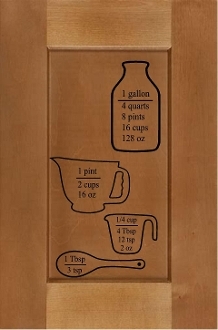 Vinyl decal measurements: gallon 8"x4.5", pint 7"x5", cup 5"x4" , spoon 9.5"x3." made from oracal 631 matte vinyl. Goes onto flat surfaces and will look like it has been painted on. If you want to remove it from the surface just heat it up with a blow dryer and lettering will peel off without damaging the surface.Check out the youtube video for application, which is very easy.